Fast food has an appeal that can’t be denied. I’ll admit that (though with a lack of quality vegetarian options, I don’t have a love for fast food that most do). I am in no way anti-fast food… so long as it’s consumed in moderation. However, the cost and questionable ingredients have me leaning towards making these luxuries at home. 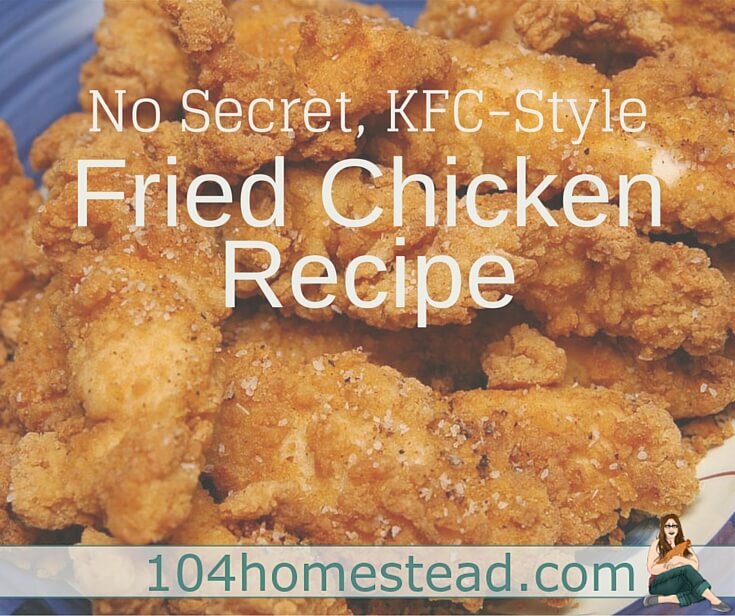 Let’s talk KFC and I’ll tell you how I make it at home. Being a vegetarian does not make me opposed to the eating of animals, it’s just not for me. I’m the only one in my household that doesn’t eat meat. We prepare it regularly and I’m okay with that. What I am not okay with is mass farming where the health and well-being of the animals is neglected to increase profit. It’s not shocking news, but KFC gets their chicken from “farms” where there is not enough space for the chicken to move, it never sees the light of day, and it is fed the lowest quality feed, supplemented with hormones and antibiotics to make up for the lack of growth on a crappy diet. Keep this in mind, you’re not just what you eat. You eat what your food eats. Yuck. Yeah, those twelve seasonings that they work so hard to keep secret under the cloak of a famous recipe, they contain some nastiness. Let’s start with MSG. Monosodium Glutamate is a flavor enhancer that has been in question for decades. I remember a particular episode of The Golden Girls where Sophia questions the use of MSG in Chinese food. According to research conducted by the US as well as Australia and New Zealand, only some people have a sensitivity and it would take quite a bit to be fatal. However, terms like “generally recognized as safe for human consumption” don’t sit well with me. Maltodextrin is an artificial sweetener used in the famous twelve spices. Maltodextrin is created using starches like corn with all of the protein and vitamins removed. The problem with this practice is that you are utilizing the proteins and vitamins stored in your body to break it down and digest it. In other words, not only does maltodextrin not benefit you in any nutritional way, it can deplete your body of nutrients. The quantity of salt in a single piece of KFC fried chicken is startling. No one needs that much salt in one sitting. In fact, table salt contains additives and anti-caking agents. Real Salt is a much healthier alternative that actually has trace minerals in it. Again, fried will never be deemed healthy, but the type of oil used certainly plays a part in how unhealthy it is. 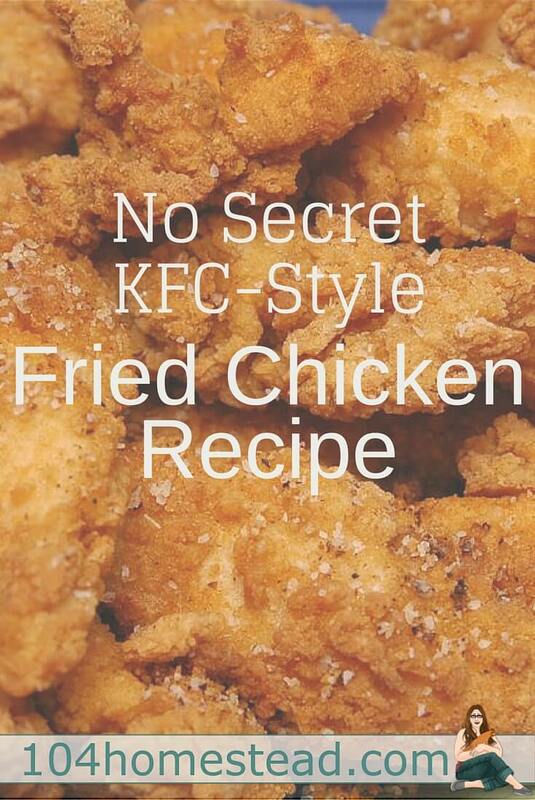 KFC fries their chicken in palm and soybean oils that are insanely high in saturated fats and calories. In your own home, you can use peanut oil, which contains less than 1/3 of the saturated fats you will find in palm oil. Combine dry ingredients in a small bowl. Coat chicken in egg whites, roll in the flour and spice mix and fry in peanut oil. * Straight from my garden. Which do you think is the better option? It’s always best to eat what you can pronounce. I haven’t had KFC in years and don’t plan on eating it anytime soon. It’s cheaper for me to eat at home than to go out. We occassionally eat out, but it is usually when we have to go to the city. But the recipe sounds awesome. I’m definitely going to have to try it. My wife and I worked out what a fast food meal would cost compared to sitting down at a diner. We are the diner capital of the world here in NJ. The costs are just about comparable. I don’t go out to eat a lot, hardly ever actually, but when I do, we will hit a local diner where we have plenty of choices (both healthy and not so healthy) and we get great table service. All for about the same price (depending on what you order).